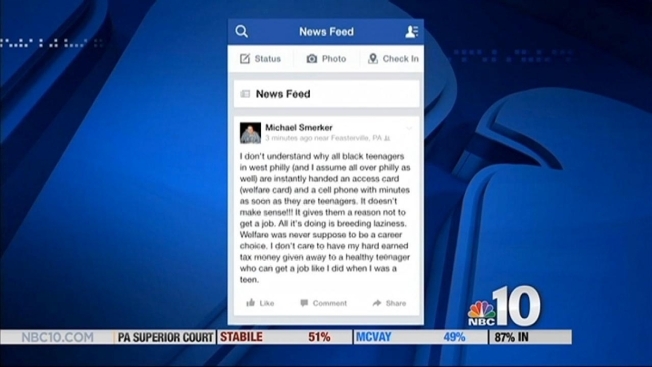 A Philadelphia police officer is under fire after he made comments on his Facebook page addressing black teenagers that some believe crossed the line. Officer Michael Smerker of the 19th District wrote the Facebook status over the weekend. "I don't understand why all black teenagers in West Philly (and I assume all over Philly as well) are instantly handed an access card (welfare card) and a cell phone with minutes as soon as they are teenagers,” he wrote. “It doesn't make sense!!! It gives them reason not to get a job. All it's doing is breeding laziness. Welfare was never supposed to be a career choice. I don't care to have my hard earned tax money given away to healthy teenagers who can get a job like I did when I was a teen." Smerker took the status down three hours after posting it after receiving some negative feedback from other Facebook users. However, a screenshot was taken and NBC10 obtained a copy. Now residents who live in the neighborhood where Smerker patrols are speaking out. Dessus says he’s owned a barbershop in the neighborhood for 15 years and works hard every day. “He should be ashamed of saying something like that and degrading people like that,” Dessus said. Philadelphia Police Lt. John Stanford, a department spokesperson, says all officers still have freedom of speech rights. “He’s protected by freedom of speech to a certain extent,” said Stanford. “However, the police department will look into everything that has taken place. Some residents in the predominately black neighborhood where Smerker patrols believe that an officer passing judgments on residents he is paid to protect and serve is a cause for concern. “I want something done about it,” said Jeff Hart. NBC10 went to Smerker’s home for comment but he wasn’t there at the time. NBC10 also learned that Smerker is currently on medical leave.